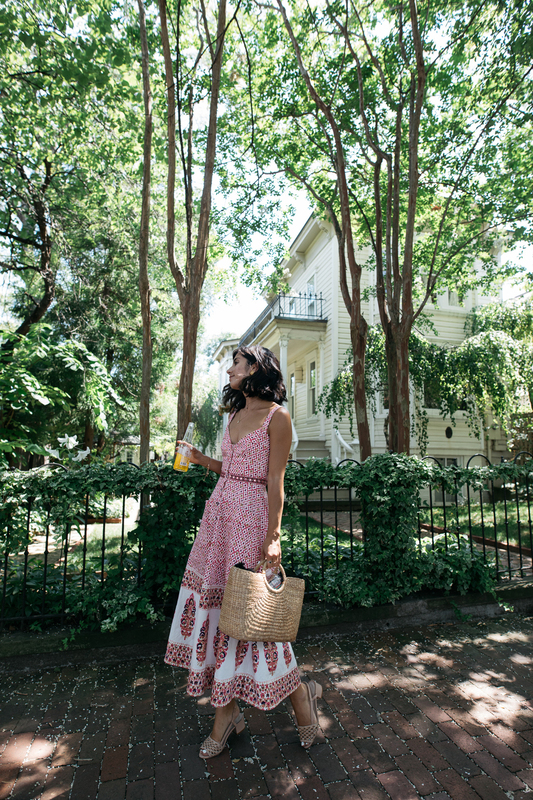 When it comes to my summer wardrobe, I practically live in sun dresses. But hey, if we’re being completely honest here, I practically live in dresses — all year long, regardless of the season. I’m a dress magpie — collecting them everywhere I go. Just last week, I popped into one of my favorite vintage shops in the West Village, Madame Matovu on W. 10th street and scooped up the most amazing 1950s shirt dress in the loveliest shade of faded green. It reminded me so much of Marge from The Talented Mr. Ripley, that I knew I had to have it. Soon after, so many of you guys on Insta Stories asked where you can find something similar, and I suppose that’s the Catch-22 with vintage pieces, isn’t it? They’re lovely and unique, with a history all their own, but when it comes to recreating the look, they’re not available at Zara in 5 different colors. They’re one of a kind (which I love!) but they can be frustrating perhaps when you can’t find something available online that’s similar. Of course, there are so many amazing brands and companies who take nods and design cues from the past, many of them marching to the beat of their own drum when it comes to eco-friendly production practices and recycling materials. Take this dress I’m wearing here for instance. It’s a current design from Saloni (who I’ve raved about before here), but if I didn’t know any better, I could have easily mistaken this beauty as a vintage shop find. I love the paisley print, the slightly sweetheart neckline and, of course, the retro flared fit. I’ve rounded up a few of my go-to vintage-inspired designers and brands of the moment — Saloni, Reformation (obvi), Beaufile, La Ligne, Silvia Tcherassi and my latest find, Amur, and while I’ll always love trolling through vintage shops, it never hurts to have a few current tricks up your sleeve either. Keep scrolling to shop and leave people guessing as to what era your dress is from! Style and new york city, nyc, summer outfits, vintage, vintage-inspired. I love that dress your wearing! I always feel so weird talking about a dress on my blog and not being able to link it to a website where the reader can immediately make a purchase. I’m starting to pick more unique pieces to share instead of being worried about affiliate links and it’s so much more enjoyable! This outfit is well put together! I love this effortlessly chic style!